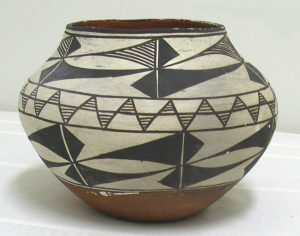 This is a new interest for us and you can expect to find baskets, totems, Pueblo pots and Navajo jewelry. 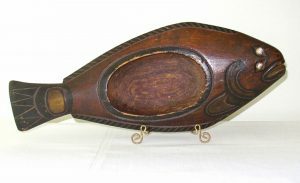 19th C. Northwest Coast Native American carved food bowl in the shape of a native halibut. Beautifully carved bowl with the halibut supported on a raised pedestal form. Well carved details with abalone inlayed eyes and original painted accents (yellow, black and red). Excellent original condition with a nice old worn patina. The wood is cedar. 19 3/8″ long, 7 3/4″ wide and 3 3/8″ high. A fine example from an old collection. Late 19th/early 20th C. Northwest Coast carved and painted cedar totem pole. 31.5″ tall. 3″ wide. Nice large size, very well carved and retaining it original painted surface. Interesting cultural imagery of the Native American life. Excellent condition. From a CT collection. 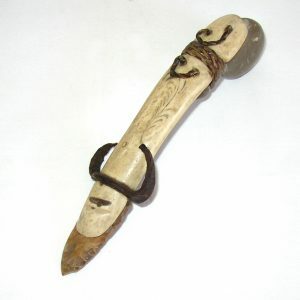 A carved animal bone “addle addle”, a tool used in hunting or foraging for food by Native Americans. There is a carved decoration in the top, and an arrow head attached to one end. 7 1/2″ long. 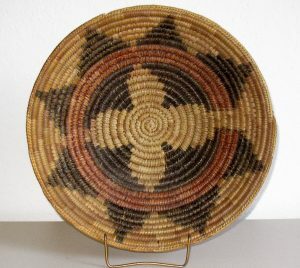 Very large (18 5/8″ diameter) and beautifully woven Indian basket with interesting subtle decorative designs created with a combination of multi-color material and physical weaving patterns that create the circular bands and 4 diamond shaped rays emanating from the center. 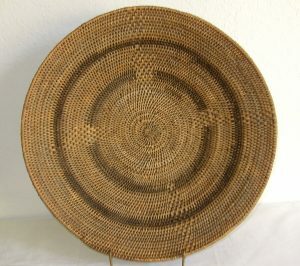 The basket is woven over coiled wood (probably willow branch) which make the basket quite strong and rigid. It is tightly woven and in excellent condition. The size is 18 5/8″ diameter, and 3 1/4″ tall. Early 20th C.
A fine and early (c. 1880) Yupik Eskimo Ceremonial Feast Ladle with red painted decorations and black painted fish design on the bowl. 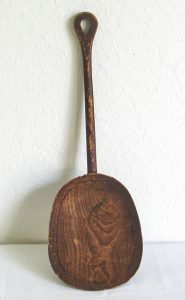 The ladle is quite large, yet delicately carved, paint decorated, and pleasingly graceful. It measures 18 1/2″ long and 6 1/2″ wide. It survives in very good condition with some nicks and a few small chips reglued on the front edge of the bowl. The natural pigments of red and black have mellowed with time. Traditionally the red pigment is made from ocher and seal blood, and the black from graphite. A fine, large high quality example. From a Washington State collection. Additional photos available on request. 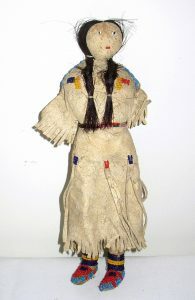 Nice Plains Indian doll with pleasing expression and hide costume with nicely beaded accents and mocassins. Early 20th C. origin. Hand sewn. She is 10 3/4″ tall. 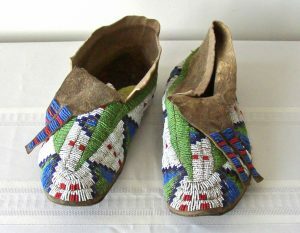 A lovely pair of large Plains Indians beaded moccasins in green, blue, red and white. They are in excellent condition with some minor bead loss on one tongue flap. 11” long from toe to heel. A very crisp and bright c. 1900 Pima Indian basket decorated with a whirling log design. Excellent original condition with no observed broken or missing stitches. Size is 11 1/4″ diameter by 2 1/2″ high. From a British Columbia collection. 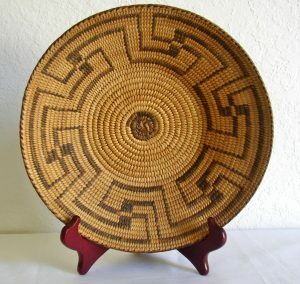 Navajo Indian basket, 15 3/4″ across and 4 1/4″ high. C. 1950. In excellent condition.